1st printing. 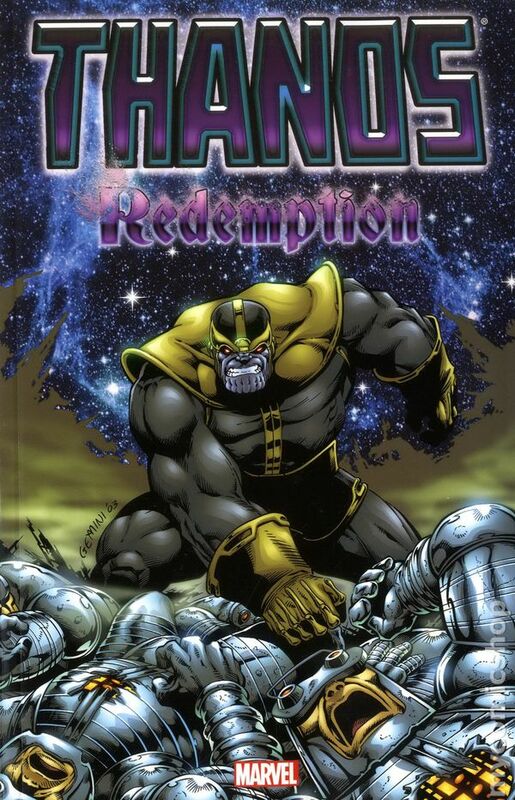 Collects Thanos (2003) #1-12. Written by Jim Starlin and Keith Giffen. Art by Jim Starlin and Ron Lim. Cover by Jim Starlin. After decades of malevolent misdeeds and vile villainy, could the Mad Titan be attempting to redeem himself? Scorned by his paramour Death and changed by his recent battles with the universe's cosmic powers, Thanos may have just decided to turn over a new leaf. But to make good on his vow, he must face the world devourer Galactus, the all-consuming universal Hunger, the unimaginably powerful Beyonder and the unknown threat of the Fallen One! Most of the universe doubts Thanos' sincerity, but a handful of uneasy allies support him: Adam Warlock, Pip the Troll, Gladiator and Star-Lord. Witness Thanos' cosmic struggle for repentance - but ask yourself, what dire fate awaits the universe if he fails? Softcover, 304 pages, full color. Cover price $34.99.